As commercial construction continues to roar on, surface protection for concrete has become one of the most common requests we receive from builders. Any work to fix or replace concrete is extremely time intensive, and also commonplace as heavy machinery and tools are used on and above finish slabs. Fortunately concrete can be one of the most straightforward finishes to protect on a jobsite. RamBoard is among the most popular floor protection products in the industry. Useful on concrete, decorative concrete, hardwood, tile, and just about everything else, RamBoard is the most cost-effective breathable concrete protection available. RamBoard is sold in 38″ x 100′ rolls, and starts at $54.90/roll, with discounts available on pallet quantities of 16 or greater. EZ Cover is another leading concrete surface protection option. Breathable and often spec’d in for concrete projects, EZ Cover allows concrete to harden and cure underneath, while providing two layers of impact protection. EZ Cover is the ideal protection for colored slabs and other high-end decorative concrete work. CoverGuard is a very strong plastic based surface protection, good for use on cured slabs, as it isn’t breathable. 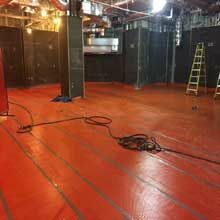 It is a diamond-plated hard plastic floor protection that can be hosed down and reused, and also cut to shape on a jobsite. CoverGuard is available in three thicknesses, as well as in a fire-resistant formulation for hospital jobsites. CoverGuard is available in 36″ and 72″ rolls, and we currently stock the 36″ rolls. This entry was posted in Uncategorized and tagged commercial protection, concrete protection, Coverguard, EZ Cover, ram board by admin. Bookmark the permalink.